This photo was taken over East London just after 1500 GMT on Saturday. It was taken by Barry Bland, who appears to be a credited across the net as a semi/pro photographer (which kinda discounts Photoshoping, as he’d never get work again if he had). 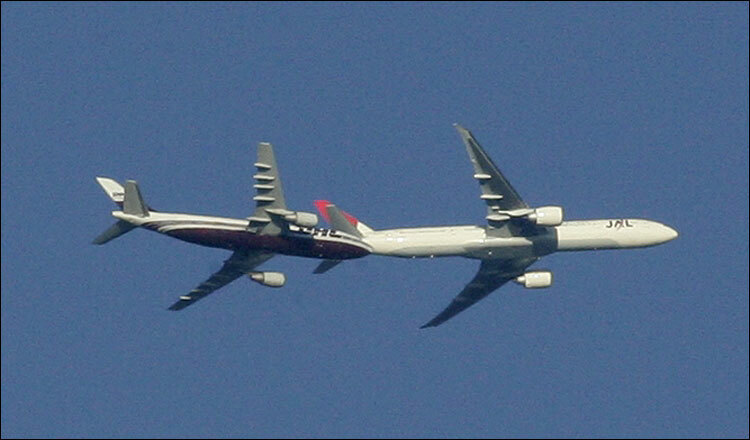 “The Civil Aviation Authority said no near miss had been reported and it was impossible to tell how close they were”. BTW: I’m sorry for the lack of updates over the past week. Sofia’s family have been visiting from Sweden and so I’ve been busy entertaining rather than geeking out. Will post some more updates today or tomorrow. I’m no maths whizz, but you would have thought they could calculate roughly how far apart they were. The dimensions of each model of plane is known, so you should be able to at least tell if they were very close or a reasonable distance apart. Surely the flight paths and altitudes are logged too. Sounds like a cover-up. 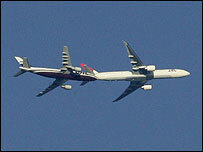 If the planes were a safe distance apart and they whole thing was an optical illusion, they’d just say so. Difficult to tell how far apart they are – forced perspective can be a convincing illusion. It’s actually a great example of how a long-lens can skew perspective to make two things look very close together. It’s a well-known photographic effect – I’m surprised that Mr Bland isn’t aware of it. But then, pap shots often use the same effect to make it appear that two celebs are much closer to each other than they really are.